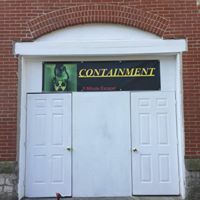 CONTAINMENT is a 5 minute escape room where you are immersed into HTH Industries a nuclear reactor facility in the middle of lockdown protocol. You have 5 minutes to find the emergency escape door and time is not on your side! Price is an additional $5 to any ticket. Open every night the Haunted Town Hall is open. Come try your luck at CONTAINMENT!